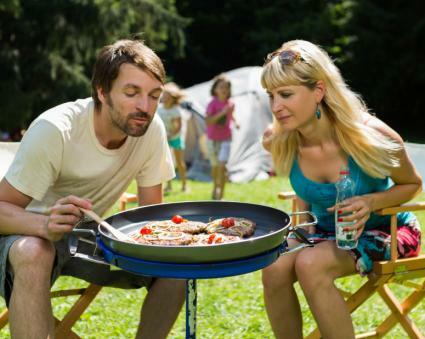 How To Have Tasty Breakfast At The Campsite? Among the greatest experiences that we can have is to be out in nature to enjoy the wilderness and being in the fresh open air. We will feel more grounded and alive as a person. The usual responsibilities of life and daily stresses would be greatly lessened while we are in the outdoor. After spending the entire day hiking up the hill and traversing river, exhaustion may take over. With hard work and good mood, comes a hearty appetite. A good meal should be welcomed by everyone and even decent food taste much better when we enjoy it in nature. Obviously, a good food will receive enthusiastic appreciation and the cook will get rave reviews for weeks to come. With a little preparation and some thought, we should be able to achieve this. Just like in a fancy restaurant, all three meals don’t have to be the same. However, breakfast and dinner are often the meals that we should think about more. Breakfast as the first meal should be quite filling and it should give us a good impression for the rest of the day. Whole grain bread with some cheese and freshly barbecued sausage should be a good option for a tasty breakfast. With all the energy that we will burn, we should appreciate a meal that’s filling and can keep us going. Oatmeal should also be a good option in the campsite and it’s easy to cook. The complex carbohydrate inside oatmeal will keep us full longer and some additions, it will be quite tasty. We may add powdered milk, some sugar and a bit of salt, to make oatmeal taste better. Raisins should also taste great when mixed with oatmeal. Strawberries, apples and mangos are fruits that we can use during breakfast in the campsite. Your regular oatmeal can taste better when there are bits of tasty fruits in it. If we want to be more adventurous with the campsite breakfast, we could also make whole wheat pancakes, which are also mixed with bits of fresh fruits. Added with some syrup, we will have a delicious creation on our plate and it will surely become a hit in the campsite. Instead of oil, it is usually more convenient for us to use butter instead, because oil tends to spill and makes everything greasy. If we want to be healthier, we may choose non-trans fat margarine. Pancakes should be quite delicious and filling for our breakfast. Banana, mango, pineapple and various tropical fruits are quite convenient to bring around. There are actually pre-packaged meal products for camping purposes, but they may not provide you with the authenticity of camp life. There are a number of considerations that you should know. As an example, we shouldn’t pack fuel with food. Even if the fuel doesn’t leak, the fume will make your food taste somewhat funny. It’s also important to keep the nature clean and leave nothing behind in the campsite, especially non biodegradable garbage. Bring some trash bags, which can be used to collect all the garbage.